JERSEY CITY, N.J. (AP) — The names are hardly as familiar as Peyton Manning and Richard Sherman. Yet, for all the megastars and All-Pros in this Super Bowl, there are guys like Jermaine Kearse and Paris Lenon. Like Michael Robinson and Terrance Knighton. Malcolm Smith and Manny Ramirez. Players who have gone from pretty much nowhere on the NFL landscape to the doorstep of a championship. Perhaps no one is more grateful for the opportunity to grab a ring than these men. Some are veterans who fit the term journeymen. Some are youngsters who went in late rounds of the draft — or were ignored altogether. All recognize they will play some sort of role in Sunday’s championship game. Some might even sneak into a starring part, the way running back Tim Smith did in 1987 or cornerback Larry Brown did in 1996. “You never know who it might be,” said Knighton, the massive defensive tackle coming off a sensational AFC championship game performance. Knighton could be the poster child for players who graduate from the depths of the NFL — “I did my four years in Jacksonville,” he said — to the top of the pro football ladder. He’s been practically unblockable in the last few weeks, rising from obscurity to recognizability as a leader of an improving defense. Coach John Fox praises the work ethic of Knighton, who was buried deep on the depth chart in training camp after being signed as a free agent away from the Jaguars. Ditto for Seattle’s Kearse, who played at the University of Washington but went undrafted in 2012. He made all of three catches that season after catching on with the Seahawks, and his job was anything but secure when Percy Harvin was acquired in a trade, and with Sidney Rice, Golden Tate and Doug Baldwin in the receiving corps for 2013. 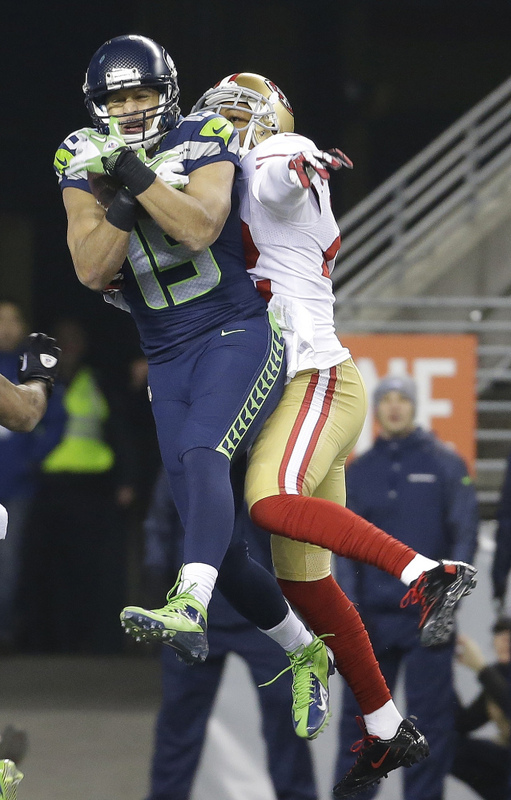 All Kearse did was go from afterthought to touchdown threat, and his 35-yard catch for the winning score against San Francisco keyed Seattle’s NFC title win. Some credit Kearse undergoing Lasik eye surgery last winter with his becoming a force, but coach Pete Carroll can’t confirm that. He can confirm that Kearse’s importance has steadily risen this season. “I don’t know for a fact that it changed things, but it sure seems like it did,” Carroll said of the surgery. “He has great athleticism, great hand-eye coordination, but he has been over the top since he came back from that. So, subjectively I would say that it had an impact, but he was good anyway. Broncos linebacker Lenon’s confidence had to be waning at various points in his 12-year career. He was on the 0-16 Lions of 2008, eight years after he was not selected in the draft. He was cut by Carolina in 2000, worked for the post office and then wound up in the XFL — if anybody remembers that short-lived league. Yet here he is, a backup to middle linebacker Wesley Woodyard who gets snaps in the regular defense, and plays some special teams. Lenon learned a lot from all that losing with the Lions. By applying those lessons, well, he’s managed another half-decade in the NFL. “When you’re in a situation like that, you have a certain amount of guys that pack it in,” Lenon said. “That’s difficult for me, because I’m not that type of person. I’m going to compete until the end. That’s the most difficult part of being in a situation like that. And a great place to be after you’ve been mired in the other side.